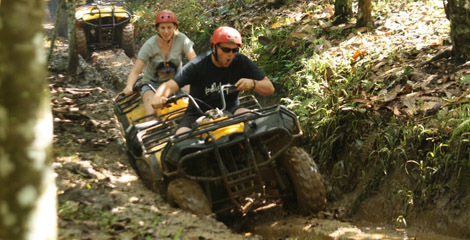 Bali adventure quat/atv tour is located in taro village, near ubud. The village has native forest, quite and peace. This trip, you explore and ride through the nature forest, village, the villager’s plantation, and rice terrace. This is good combination, between nature, and adventure. Easy drive with 250 cc for 2 hours, and during this trip, you drive with following our guide instructor to make your trip fun and safe. Note: will have extra charge if picked up beyond nusa dua, kuta, sanur and ubud. Please notice us if pick up in different areas.